Getting access to detailed and up to date pay costs across multiple pay buckets. 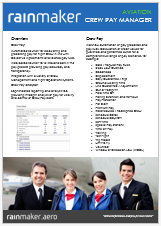 Gain better insight into the overall Crew Pay process and related costs. How does published cost per block hour compare to performed? What is the trend of a specific pay bucket cost day-by-day or over an entire year? What combination of crew category and crew base has the highest cost per crewmember for a specific pay bucket? Self-drive Analysis, ad-hoc and more complex analysis can be performed by accessing the Crew Pay Analyser Cube directly using off the shelf data mining tools such as Microsoft Excel.